What is Planning Camp and why should you be there? It’s an unconference exploring urban planning, technology, and social change. It will be fun, inclusive and engaging! Urban Strategies Council and OpenPlans are excited to bring PlanningCamp to Oakland and the East Bay! Be there on October 12th (yes this Saturday!) if you’re working at the intersection of technology and the hard effort of making better cities – on the technology side, or the planning side, or a bit of both. To be held at Laney College, this one day unconference is a conference where sessions are programmed and led by the attendees. Unconferences are popular in the tech world because they reflect the culture of the industry – hands-on, flexible, a little casual but very hard working. All the sessions are open for attendees to define, describe, and lead. You’ll find the format to be energizing and entertaining. Join us and spend a day in sessions led by your peers, exploring new and old challenges. 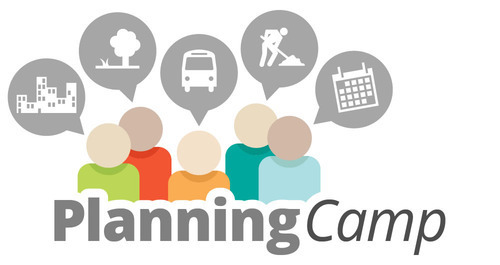 Whether you’re thinking about the role technology in public involvement, increasing equity, modeling, analysis, community organizing, at local to regional scales, PlanningCamp will be an opportunity to go deep into conversations and form new connections. NACTO urban street design guide: How do we change the DNA of city streets? Gentrification of the waterfront after Sandy in Nook. Participatory Budgeting: how can we keep the bad ideas out? Carshare & self driving cars: How do we repurpose the street? Measuring the Quality of Bicycle Infrastructure. to E 10th St. We’re just a block away from the Lake Merritt BART, close to AC Transit bus lines, and totally accessible by bike.